Well, Mama Beach once had a tranquil, retreat-like atmosphere at the base of the towering cliffs of Ton Sai bay but now not so much with the large-ish new hotel called PP Cliff Resort (formerly the Phi Phi Popular Bungalows) being built alongside and behind it, and a big redevelopment underway at Nice Bungalows next door as of August 2014. Ad Book now! Rates from US$123++. Average rating 8.3 from 1,532 reviews. Hopefully once these projects are complete the peace will be restored. Accommodation is in the form of a cluster of three-storey buildings, not all of which face the beach (the cheapest rooms have no beach views), with a lawn running down to the sand. 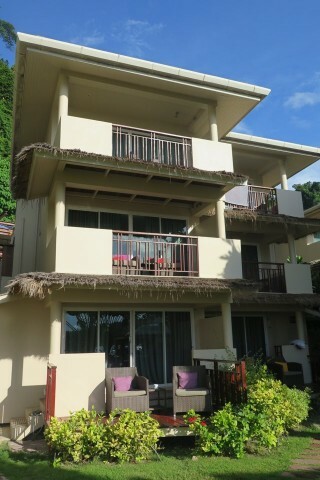 Rooms are well decked out and decorated with a style not seen anywhere else on Ko Phi Phi. They’re air-con throughout and come with minibar, flatscreen TV, safe and WiFi, which was mostly unusable during our visit. Its sleek bathrooms with the partial open-roof showers were once a neat feature, but now with the big multi-storey resort/construction site looming behind the curtains need to be drawn at all times. Rates are high for a property with no swimming pool, but if you do opt for here, it is probably worth paying the extra to get a beach view. We’d recommend an upper floor room if you want more privacy. Do check upon booking about the status of the nearby construction works – discounts may be on offer if these are still in progress. Prices include breakfast.